It is a tonic that soothes and nourishes the skin, dating back thousands of years. Rose water is an ancient remedy and an all-purpose beauty treatment recognized all over the world. That’s why we researched a variety of new and bestselling products – to help you find the best rose water available. The result is our top ten rose water review list below. Now: Before we get started, here’s what you need to know when shopping. You’re going to feel fabulous. Organic: The primary ingredient of rose water is, of course, roses. Some of our sweet-smelling selections are prepped with only organic red roses. We mark the “Organic” column with a simple yes or no for you as you go shopping. 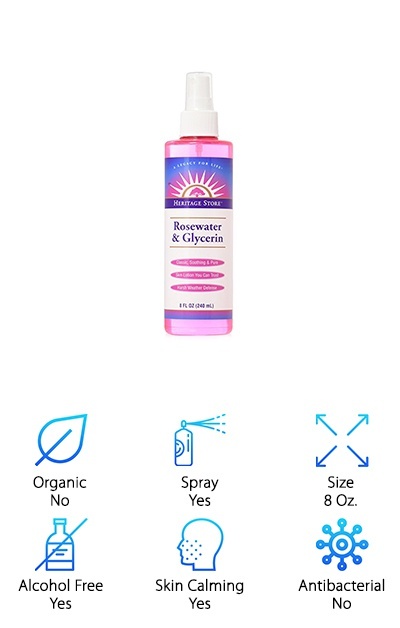 Spray: There are a variety of application bottles available in the rose water universe. Some of our favorites come in spray bottles, while others are meant to be applied to makeup pads or cotton balls. You'll find the applicator you like most. Size: Rose water bottles can last a long time because a little goes a long way. We include the number of ounces you receive with every one of these purchases so that you know how much supply you're getting. Alcohol-Free: Rose water can come in a number of different formulations, and some include alcohol, while others do not. Another “yes or no” marking here will tell you if alcohol is one of the ingredients in your favorite rose water. Skin Calming: Rose water is known to be soothing to the skin. It can naturally ease redness and other potential conditions. To see if it’s right for you, check our “Skin Calming” column for additional guidance. It might be what you’re looking for! Antibacterial: Antibacterial products are common in the makeup, beauty, soap and cleansing industries. Some of our rose water selections have antibacterial properties, too. We’ve included a note on whether or not your rose water will inhibit bacterial growth. Now that you know what to look for when you’re searching for the best rose water, it’s time to head to the reviews. Here’s the deal: If you’re in a hurry, take a look at our top pick and our budget pick. Both are fantastic products and are amongst the very best rose water bottles we found. Right below, you'll find all runner-ups in our rose water reviews. If you're looking for the best rose water spray, chances are, it's here. Are you intrigued by rose water, but you’re not sure that it’s right for you? The best organic rose water is made from flowers, with no added ingredients. That's why we made Rose Water Facial Toner by Leven Rose our top pick. Chemicals and alcohol have not been added here. There are no oils, no glycerin, and no added fragrance. You get a floral, grassy scent made naturally by Mother Earth. 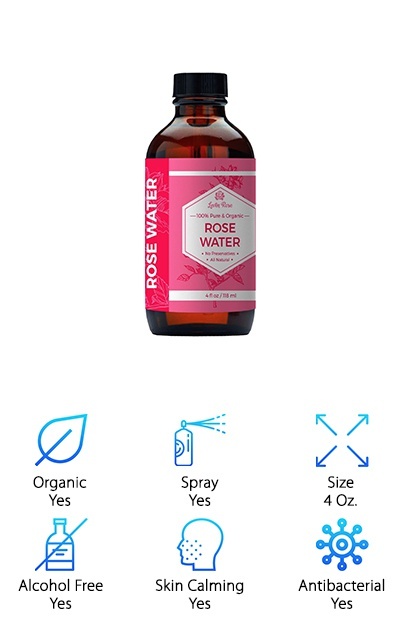 This rose water comes in a dark 4-ounce bottle. The amber bottle protects your rose water from oxidation and lengthens its shelf life. Both men and women will love adding rose water to their skincare regimes. It can help with redness and clear away acne-causing bacteria. You can cleanse with a natural oil like Argan, and then apply rose water as a natural toner. People with sensitive or dry skin will love rose water's soothing properties. It is extremely hydrating and can be added as an ingredient in lotions and oils. Do you know how to make rose water? It is a distillation of pure roses, stem and all in some cases. The plant is steamed, and the essence is then bottled for your enjoyment. 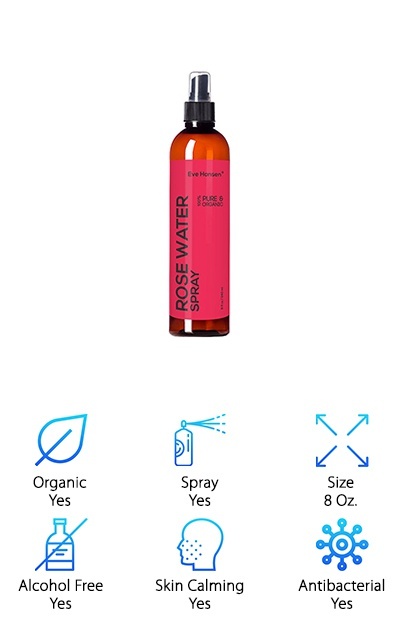 Teddie Organics Rose Water Facial Toner is a great way to introduce yourself to the marvelous properties of rose water. The best rose water toner can be used before or after cleansing, or on its own. Like so many of our reviewer’s selections, it has no added chemicals or fragrances. It is triple distilled for purity. This toner does not have added alcohol or witch hazel, either. 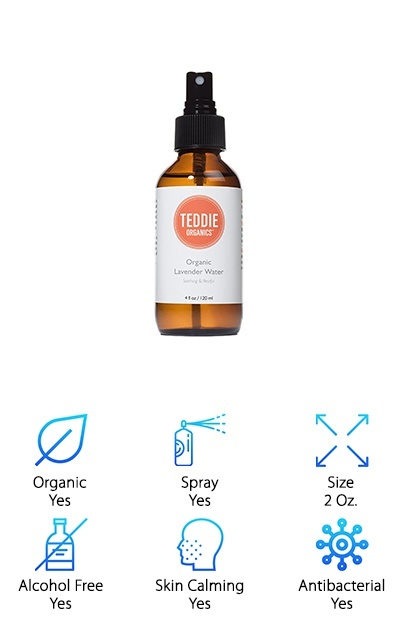 Two ounces of the Teddie Organics product will last a long time. You need a very small amount for a single application. There are no skin types which will not benefit from a little rose water. Its anti-inflammatory properties help clear away bacteria and soothe redness. Pour yourself a bubble bath, add a capful of rose water and drift away. Rose water is a luxury product, but it is also highly affordable. Want proof? 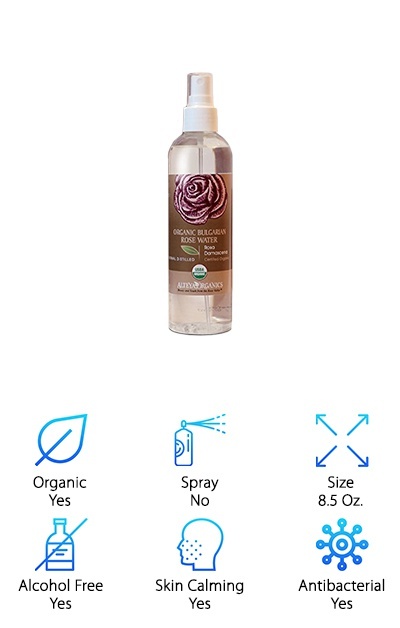 Check out this Eve Hansen Organic Rose Water Spray. 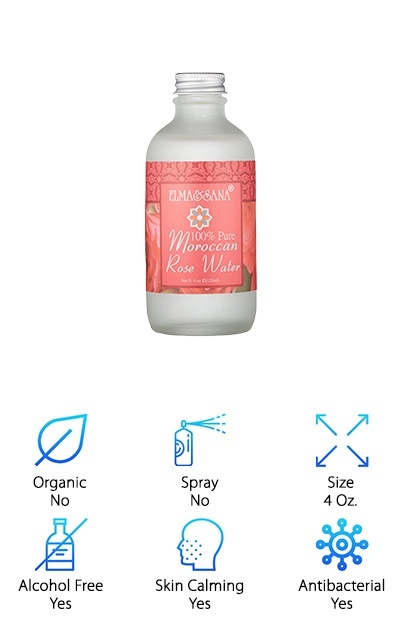 You get a whopping 8 ounces of pure Moroccan rose water. It is a distillation of the flower, and nothing more. No scents or fragrances are added. There are no additional chemicals, alcohol or other ingredients. There is only one. If your skin is irritated and red, this product is definitely worth a try. It can ease issues with flakiness, acne, eczema, and more without drying the skin out any further. In fact, this is an essential prep item for applying makeup. Mist Eve Hansen rose water all over your face before moisturizing and applying foundation to really lock in your look. By the way, rose water works for more than just skin. If your hair is dull and frizzy, turn the spray toward your locks. It’ll add shine and definition to curls and straight hair, too! It’s true: There are only a few brand names associated with excellent, high-quality skincare all over the world. Mario Badescu is one of them. His Facial Spray with aloe, herbs, and rosewater is a cult favorite amongst diehard skincare enthusiasts. Why? It’s a classic blend of hydrating ingredients meant to provide a pick-me-up for tired skin. All skin types will benefit from this magical little bottle. Mist it on your hair, face, and décolletage for an instant feeling of renewal and revitalization. The aloe will assist with moisturization, and the herbs and rose water will soothe and calm. Add it to your hair conditioner for a bonus boost of hydration. Mix it with your face cream, too! 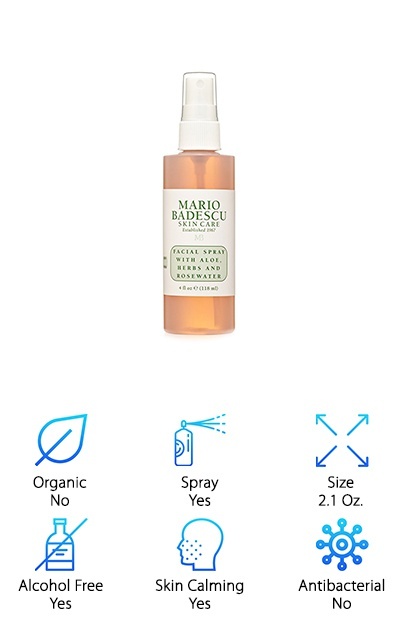 You will receive a generous 2.1-ounce bottle of Mario Badescu’s star product. It has no alcohol added – it’s loaded with thyme, gardenia, rose and aloe vera. Bladderwrack, another primary herbal ingredient, also nourishes. This very affordable spray will become a favorite in your arsenal. Your skin will bloom with health when you try InstaNatural Rose Water Facial Toner. You will receive a beautiful 4-ounce bottle loaded with nothing but rose water, created naturally with no artificial ingredients. Rose water is full of antioxidants, along with Vitamin A and Vitamin C. These are all excellent for skincare and haircare use. Incorporate rose water into your bedtime routine by massaging it into your skin, and use the spray attachment to spritz it onto your sheets. The natural floral scent will carry you away and into your dreams. This is hydration in its purest form! Here’s one example: Red, angry skin can be soothed by rose water. In fact, it’s a wonderful option for combining with aloe vera when you are treating a sunburn. It is also a natural toner and will balance skin's pH levels. 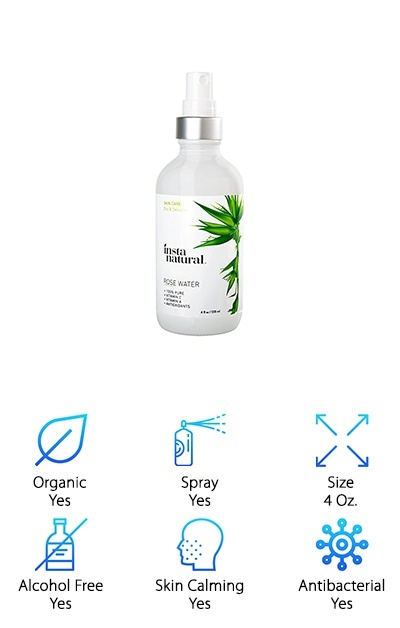 You have to try InstaNatural Facial Toner if you’re looking for smoother, softer skin. Spray it on hair for shine, too! You love rose water, but you want to blend it with more optimal ingredients to nourish and revitalize skin. You can experiment with different formulas at home, but that isn’t necessary any longer. What would you say if we told you this skin product already exists, and it’s one of the most popular items around? 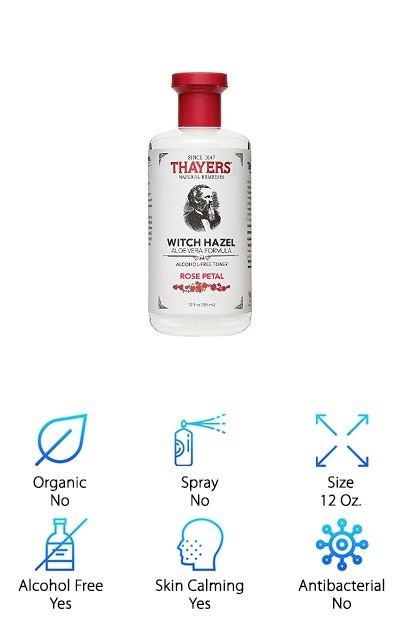 Thayers Alcohol-Free Rose Petal Toner is filled with natural herb and plant extracts and fragrances. It is a combination of witch hazel, aloe vera, roses, and citrus. You might forget about everything else you have to get done when this 12-ounce bottle arrives at your doorstep. The Thayers have been creating and producing fabulous skin creams, toners and more for over 100 years. This one is free of alcohol, parabens, and phthalates. It is hypoallergenic and contains lots of Vitamin E for optimal skin health. Need to relax? Mix this toner with a little lavender or avocado oil to make a fantastic massage oil. The Damask rose, also known as the rose of Castile, is a remarkable flower. It symbolizes love and beauty all over the world. It is an edible bloom, used to make everything from teas to sugary treats. It is also the rose used to make rose water, the ancient natural remedy. Elma and Sana 100% Pure Moroccan Rose Water is made from Damask roses. You will know the difference as soon as you open the bottle. You can add it to skincare masks to help tighten pores and placate angry skin. Sprinkle a few drops into your night cream to add a soothing touch. People with dry skin, oily skin or combination skin can all benefit from this product. Use it as both a natural makeup remover, cleanser, and toner. This water is alcohol-free, with antibacterial properties. There are no artificial ingredients in use here. Let your face bloom by adding Elma and Sana Rose Water to your skincare routine. Heritage Store Rosewater and Glycerin is one of our favorite items on this list because it’s combined with glycerin. Glycerin protects skin and moisturizes it. In combination, this spray becomes a dynamic duo with dozens of potential applications. Many customers love the Heritage Store spray’s ability to set makeup and give you a dewy look after it is applied. It can also be used as aromatherapy, or as a natural perfume. Spritz this spray into hair to combat dead ends and provide a little shine. With 8 ounces of rose water and glycerin, it will last a long time. Rose water is popular now, but it has been used for centuries in Middle Eastern and South Asian cultures. It is an ingredient in some of the most famous Turkish and Persian desserts. And your beauty routine will never be the same after it is introduced. Even the water in this bottle is special, it has been vortexed and magnetized. Beauty is in the eye of the beholder, but you will feel just a little more beautiful when this Teak Naturals Rosewater Toner settles into your skin, enriching it with vitamins, antioxidants, and moisture. The toner is 100% pure, natural, organic rose water made from Moroccan Damask roses. In addition to its use as a toner, it can also cleanse and remove makeup. As a hydrosol, it will reduce redness and act as a balm for irritated skin. 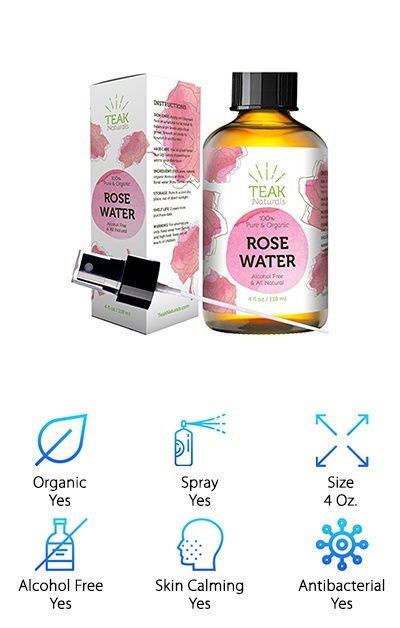 Teak Naturals Rosewater Toner comes in an amber glass bottle to protect the rose water from UV damage. Store it in a cool, dry place. With 4 ounces of this water, you can spritz your face lightly in the morning and at night. It can also hydrate the rest of your skin and your hair. There is no alcohol in this rose water, and there are no additives. A little bit goes a very long way! Revitalize your beauty routine today. Bulgaria is one of the world’s largest producers of rose water. In fact, Bulgarian farmers grow millions of the famous Damask rose in what's known as "Rose Valley." These roses are steamed to transfer their floral essence into the water, transferring this valuable distillation for you. Many rose water products are a blend of rose oil and water. This is not – it is made the old-fashioned way. The roses grown by the farmers supplying Alteya Organics are, in fact, organic. They are so pure, Alteya Organic Bulgarian Rose Water is recommended for use in food, too. Create traditional Middle Eastern and South Asian dishes with this delicate ingredient. Rose water is well-known as an astringent and a cleanser. Users are floored by their soft, clear skin. Add it to your bubble bath or your favorite face mask for an indulgent treat. There are 8.5 ounces of the rose water in this lovely bottle, and it will last for years.